This week we will learn about what coping skills work for you and collaborate to develop new ones. During this session we will create positive affirmations about ourselves and each other and meet our Yoga Instructors. We will be practicing/observing Yoga with licensed instructors and learning about mindfulness. This isn’t your momma’s Yoga! This session we will discuss talking with others about self-injury and write letters to those close to you. 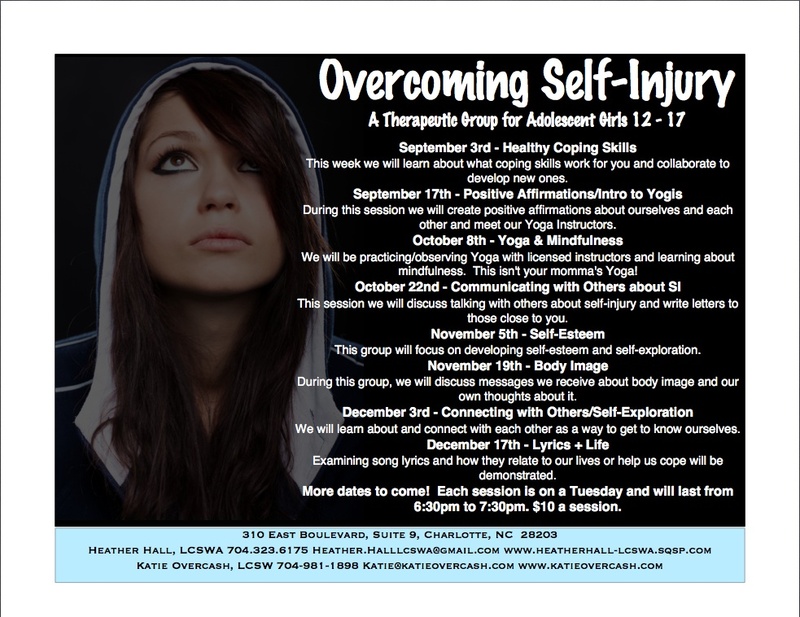 This group will focus on developing self-esteem and self-exploration. During this group, we will discuss messages we receive about body image and our own thoughts about it. We will learn about and connect with each other as a way to get to know ourselves. Examining song lyrics and how they relate to our lives or help us cope will be demonstrated. More dates to come! Each session is on a Tuesday and will last from 6:30pm to 7:30pm. $10 a session. This entry was posted in Uncategorized on August 20, 2013 by katieovercash.